Two sisters, Satsuki and Mei, and their father, Dr. Kusakabe, move in to a new house up on a hill. The house is located near a large forest, where mysterious, though friendly, creatures that embody the spirit of the forest known as Totoro dwell, whom only children can see. Satsuki and Mei befriend the Totoro and hang around with him and the other Totoros doing ... Totoro stuff, such as riding in a bus shaped like a cat, and visiting their ill mother at the hospital. Of all the Ghibli movies I've seen domestically released in America, My Neighbor Totoro is by far the most simple to understand. No heavy themes of Japanese culture, no deep plot, no villains ... it's mainly a story about two girls hanging around with forest spirits known as Totoros. So why do I fail to see this as one of Miyazaki Hayao's masterpieces? Well, mainly, and this is just me here, the movie moves so SSSSLLLLOOOWWWW. This makes other Studio Ghibli works such as Kiki's Delivery Serivce and Spirited Away look as action-packed as the Terminator movies. One can only take watching two girls running around inside a house for so long in the first twenty minutes of the movie before wandering "When are the Totoro going to come?". Indeed they do come, though, and boy do they save this movie from mediocrity. The Totoro, quite simply, are adorable, and it's no wonder why they're used as the logo for Studio Ghibli today. In fact, the Totoro, and watching the abilities they have (such as flight and making plants grow) are far more entertaining than anything else in this movie. Any scene involving the Totoro, including other scenes such as the cat bus and the flight around town, remind me of the charm that director Miyazaki Hayao is truly capable of. Unfortunately, the Totoro don't even come until about halfway into the movie, so until then, you watch people do stuff. And more stuff. And even more stuff. 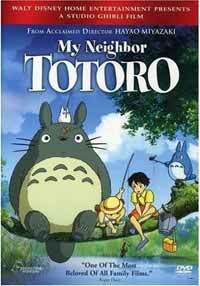 Fortunately, deep plot aside, My Neighbor Totoro retains the other features found in every other Miyazaki Hayao movie. The animation is simply wonderful, depciting the outdoors better than arguably most other animated movies to date. The music is calm and beautiful, and the opening and ending themes are very cute (even in English, I dare say). The dub, aside from using the voice of Rugrats' Angelica Pickles as Mei, is very well done, though I wish Fox released this in Japanese on DVD like Buena Vista did with their Studio Ghibli DVD releases (or at least re-release it on DVD with the Japanese language put in ... yeesh). And, of course, the characters are definitely likable, from Satsuki and her little sister Mei, to their father, to those who don't even play a big role in the movie. In short, I don't regret buying and watching My Neighbor Totoro. I just fail to understand how this movie can make so many hits and then make two giant misses on the thing that makes every other Studio Ghibli work, well, work: a gripping, engrossing plot, and entertainiment value for people of all ages, not just little children. The only three types of people who can truly enjoy this movie for what it is are little kids themselves, die-hard Studio Ghibli fanatics, or those who long for the simple, happy days of childhood. And unfortunately for me, I'm not among these types.